Generac GP7500E : One of the best 7500 watt generators you can buy. What’s the best 7500 generator for your money? Keep reading and find out. The image above reveals one of our top picks (hint: Generac 7500 watt). The first question when someone starts talking about generators is… What is a generator? The internet provides us with a variety of complicated answers to such an innocent question. Sometimes it’s so hard to translate all the technical terms into simple practical knowledge. That is the reason why most people do not even bother to find out the core meaning of the word ‘generator’. A generator is a device that is designed to produce electricity. How? A simple way of saying it would be, a generator converts mechanical energy into electrical energy. Simple? No? Well then a little more information will help. Every object that is in motion has a certain amount of energy. This is called mechanical energy. It is associated both with position of the object as well as the motion at which it is traveling. As we dwell into the functioning a generator, you will get a better understanding of how it works. A generator uses the simple principle that a man called Michael Faraday discovered, all the way back in 1831. He called this principle, the ‘Principle of electromagnetic induction’. Sounds complicated? Let’s simplify it. First things first… Let’s clarify what an electric current really is. The movement or flow of electric charges is called electric current. This is the same current that powers devices in your home. The next thing we need to understand is what an electric conductor is. Any device that allows electric charges to flow through it is called an electric conductor. Those devices which do not allow the current to flow through it easily are called bad conductors. Good conductors allow the electric current to move through them easily. Ideal for construction sites, natural disasters, & power outages. WEN Reviews. Why is this important? You will understand why in a moment. Faraday discovered that if you moved an electric conductor (a wire), through a magnetic field electric charges would begin to flow through the wire. This principle forms the basis on which generators were designed and made. That being said, you will imagine huge magnets and large lengths of wire. Today’s generators however come in relatively compact sizes compared to the initial ones. Each generator has a different size and a different output. Choosing the right sized generator is very important. This is simply because, the generator needs to support your electricity requirements. If your generator is too small, chances are you will be putting a high load of stress on the device. This means that the generator will have potential malfunctions and your entire maintenance costs will also increase. Aside from this, a wrong sized generator can also adversely affect the devices that it is supplying power to. This means that you will have frequent equipment failures. Inadvertently, your expenditure will also rise. Before we start talking about how to choose the right size, it is prudent that we understand what are the different ranges of generators that are available in the market. Generators can be broadly divided based on the place where they are used. Residential generators have capacities which range from 5kW to 50kW. Commercial generators on the other hand, are much larger. These have capacities which range from 50kW to over 3 Megawatts. Many people believe that a small generator will do the job. The reason that people give for this rationale is that they do not use the generator all the time. This is in fact a very popular myth and it is advisable not to follow the same line of thought. Why? The size of the generator does not depend upon the duration of it’s use. It however depends on how much power the device is required to provide. By under sizing the device, you put undue load on it as well as all the equipment it supplies. In this case remember that having more power is always better than having less power. If you need to calculate on your own, there are certain things that you must keep in mind. The wattage of each item both at the starting point as well as when the device is on. Most people will wonder how to get the wattage of each item. This information is usually written on a plate on the concerned device. If it isn’t, then check the manual. If by some chance you have misplaced the manual, type the model number on the any search engine on the internet and you will get the required details. Calculating the wattage required is complicated and time consuming. More importantly, you cannot afford to get your calculations wrong. Use the following interactive wattage calculator (from Westinghouse) to determine the right size generator for your needs. Don’t skip this part! Let’s take a quick glance at some generators that have gained popularity over the last few years. For full details on generator sizing I recommend reading our comprehensive article entitled: What Size Generator do I Need? This goes into great detail on how to select the right size generator. It truly is important. There’s no sense in spending money on a generator that won’t handle all the electrical devices you plan on powering. Although, we recommend buying a slightly larger generator than you think you need because it’s better to have too much power than not enough. A 7500 watt generator is an excellent size for most homeowners because it provides more than enough power to run a wide range of home devices. Excellent build quality + reliability makes this a fantastic generator. Easy to start with our Westinghouse One-Touch Electric Start System. VR System : Voltage regulated power. Quiet operation via our Pulse-Flo muffler- creating one of the quietest generators on the market. Includes everything to get started right out of the box-wheel kit & handle kit (some assembly required) oil, funnel, and a tool kit. Electric start: Also has manual start. Includes battery for electric start. Cast iron sleeved 420 cc engine with 6.6-gallon fuel tank. Outlets: Qty 4 = 5-20R 120-volt; Qty 1 = L14-30R 120/240-volt twist. 11 hours of run time at 50% load. Noise reduction Pulse Flo muffler. The Westinghouse WH7500E is designed to be a portable generator. The designers have not cut corners when designing this particular model. The WH7500E has easily made it’s way to the list of the top five portable generators. Let us take a look at why this model is so special. This model is fitted with a particularly heavy duty engine. It even comes with cast iron cylinder sleeves, forged pistons and connecting rods. Got a little lost in the technical jargon did you? The multitude of words simply meant that the WH7500E has an engine which is durable. It doesn’t come as surprise when Westinghouse claims that this model generates a lot of electricity. The WH7500E generates around 9000 surge watts and 7500 running watts. This is something that you may want to note down. After all, it is one of the main criteria that you should check before deciding on the model you want to buy. The WH7500E has an inbuilt voltage control feature. This makes this generator relatively stable compared to others. It also ensures a high quality electrical output which is safe for your devices to use. 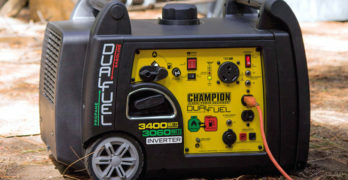 This generator boasts of fantastic run-time. Most of the generator models run for eight to ten hours at half load. What does that mean? It means that once you fill the generator up with fuel, it will take the generator eight to ten hours to use half of the fuel in the tank. The WH7500E has a distinct advantage here. It can last for twelve to thirteen hours on half tank. The reduced usage of fuel means that the WH7500E is both efficient and more environment friendly as compared to other models. Solid metal cage reduces vibration. How does the generator start? Many of the older generators require to be hand cranked. This means that you have to spend some time and a considerable amount of effort and energy to get them started. The WH7500E has a distinct advantage here. It has an electric start option which makes it easy and convenient to use. Another important feature that we look at is the noise level. The WH7500E comes with an oversized noise reduction pulse flo muffler. This helps reduce the sound output to as low as 71 decibels. This is extremely impressive given the fact that it is a many 5000 watt generators are usually much louder. Though the device is definitely not light, it is surprisingly compact. The measurements of the device are 27 inches in length, 22 inches in height and 20.5 inches in breadth. This will give you a rough idea of how big the WH7500E is. Though the weight makes portability an issue, the device comes with it’s own wheel kit and collapsible wheelbarrow handles. **If you need a smaller generator (and cheaper), consider the Westinghouse WH5500 (5500 watt) generator. Same quality as the 7500 watt but provides less power. 6,750 starting Watts / 5,500 running Watts. Includes: Wheel kit, Oil and funnel, Assembly tools. A good investment if you need portable power. Heavy-duty, never-flat wheels for reliable transportation. View or download the Generac Product Guide. The Generac GP7500E is another great device. It packs a power output of 7500 watts and has a surge power of up to 9375 watts. What does this mean for us? It means that the Generac GP7500E can easily power a small home. Is that all that the Generac GP7500E has to offer? Let’s take a look at the model to find out! The Generac GP7500E is powered by a 420cc OHV engine. This engine runs at 3600 rpm. This is what gives the Generac GP7500E the ability to produce so much electricity. The heavy duty hardened steel tube used in the engine makes it extremely durable. This is a gas portable generator. It can run straight through the night. CARB Compliant. Meets strict emission standards. This particular model offers two start options. One is the conventional recoil start system and the second is the more advanced electrical start system. This means that you can choose whichever method makes you more comfortable. The electrical start system uses a 12V 10AH lead battery. The model unfortunately does not come with a DC plug. Luckily it offers you a variety of options in terms of AC outlets. Make sure you confirm which one is best suited for you before you install this device. Another interesting feature that has been incorporated in this model is the splash lubricant system. In addition to this, the model also comes with a low-oil shut down feature. This means that the Generac GP7500E will automatically shut down the moment it senses that there is less amount of oil in it’s system. This can save you a lot of maintenance costs which can be incurred if you do not regularly top up the oil. Like the WH7500E, the Generac GP7500E also has a twelve hour half tank time. This makes it energy efficient and more environment friendly than other models. The Generac GP7500E comes equipped with an hour meter. This meter lets you know how much time you have between each maintenance check. Regular maintenance checks ensure that the device functions optimally. It uses low tone mufflers to reduce the noise that it produces. Learn more on the Generac site. Get the best of both worlds. Uses two types of fuel. Versatile and reliable. Fantastic emergency generator. Capable of powering your Refrigerator, well pump, microwave, heater blower and lights. 9 hours @50% load on 6.6 Gallons of Gasoline-Spend less time refueling. 389cc 4-stroke Air cooled OHV motor – Plenty of strength to produce the power you need. 73 dB Noise level – Quiet Operation spark arrest muffler. Low oil shutdown : Prevents generator from running on low oil levels. Digital Hour/Volt/Hz Meter : Hour meter — Tracks your run-time for scheduled maintenance and Volt meter. Ensures correct voltage for your appliances. Fuel gauge : Informs you when you need to add fuel. 10” wheels never go flat. Includes wheel kit, making it easy to move around. View or download the MANUAL for the ST-GP7500DEB. The Smarter tools ST-GP7500DEB makes another good choice if you are looking for a generator. It is a hardworking device which is said to provide comfort to the owner. Let us take a look at just how this particular device functions. The ST-GP7500DEB has a 398cc, 13HP, 4-stroke, OHV engine. The engine is air cooled. This is what gives the device the 7500 surge watts and the 6200 continuous watts. The engine runs for nine hours on 50 percent of tank. It’s engine holds around 6.6 gallons of fuel. The ST-GP7500DEB can be run either on unleaded natural gas or on propane (LPG). The digital meter keeps track of the devices need for maintenance. It serves as a reminder for the owner so that frequent maintenance checkups are done. Examples of wattage to run devices. The device also comes with a fuel gauge which enables you to check and see what is the level of fuel in the tank. This means you won’t run out of fuel suddenly. You can also top up the tank before it runs dry! The ST-GP7500DEB comes with a low oil shutdown function. This is extremely useful as you don’t want to unknowingly cause harm to the machine. Another great feature is the ten inch wheels which come along with the device. It makes the ST-GP7500DEB extremely portable and easy to move. An overload protection has also been incorporated into the device. This helps to protect both the device and your appliances. Learn more on the Smarter Tools Site. Is a 7500 Generator the Correct Size for You? The brief overview of the above three different generators helps us understand that though each device has it’s own engine and own mechanism, the end product is always electricity. The devices can be compared with each other based on the amount of electricity that they provide. Some people also like to compare noise levels. Noise levels are important because you don’t want a noisy generator hammering out a tune next to your backdoor. Choosing a generator may seem difficult. With an expert appraisal of your house and electricity needs, the choices get narrowed down considerably. The rule of thumb is… Less is never the best! Maximize the full power from your generator. Power your home with your portable generator. 10-circuit, 30 Amp manual transfer switch kit includes everything required for a complete transfer switch installation. View or download the MANUAL. It’s always good to know what you’re getting into before buying a product. And, if you don’t know what you’re doing, hire a trained electrician. For use for generators UP TO 8000-watts.